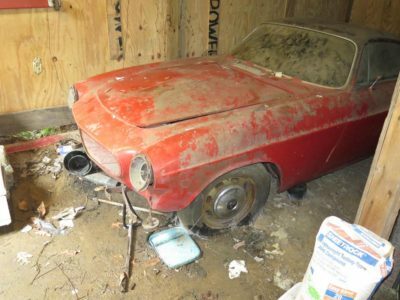 If you have not already seen Konrad Sauer’s update on the restoration of the 1968 Volvo P1800 I disposed of in his direction, give it a look. The car, of which there were only about 125,000 produced over a 13 year period, was made famous in the early 60s British television series “The Saint” starring the utra-cool Roger Moore. Here’s just one of the dozens of pics. 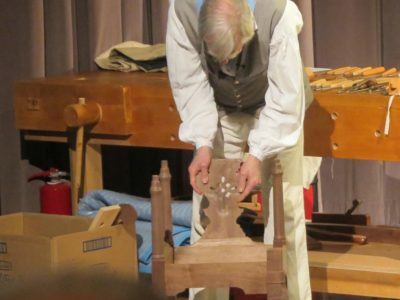 In addition to serving as the Master of Ceremonies for the Working Wood in the 18th Century event, Anthony Hay shop master Kaare Loftheim took to the stage to show us the developments of the corner chair made up the road in the Walker shop near Fredericksburg. 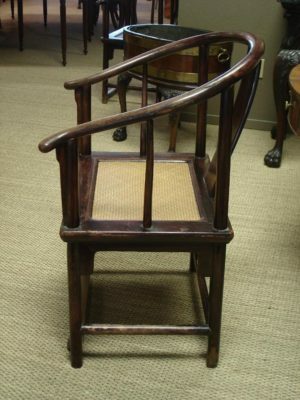 This iconic chair form, perhaps most notable for the thunder mug contained underneath the upholstered slip seat, provided inspiration for many other chairmakers of the period. Maybe while they were sitting… oh, never mind. Kaare was particularly struck by the stylistic variations of the form within the same shop. 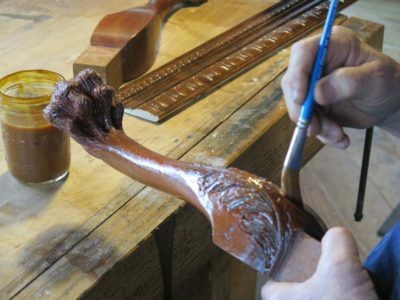 He spent considerable time pointing out the salient details from the version of the chair he was replicating in black walnut. 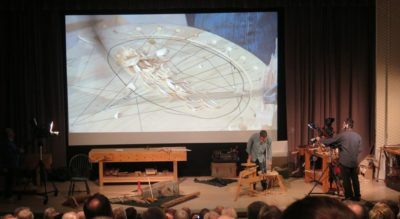 For the on-stage demonstration Kaare did the layout and carving in basswood so it would proceed more quickly and we could get his points in a hurry. I am pretty sure that “working in a highly detailed artistic and technical exercise while an audience watches the results a 100x magnification” fits at least some definition of fearlessness. Most of the structural creation had been accomplished prior to the event, but it still had to fit together properly. It did. Prior to the last year or so I was only barely acquainted with Kaare personally, and it has been a true delight to get to know him better over that time and I look forward to the next time our paths cross. 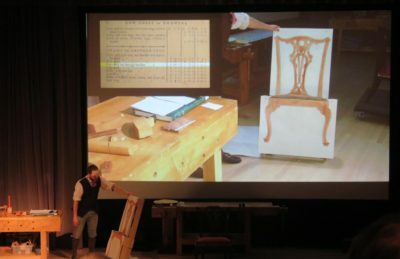 Anthony Hay cabinet shop journeyman Bill Pavlak bit off the challenge of making a chair illustrated in Chippendale’s Director. 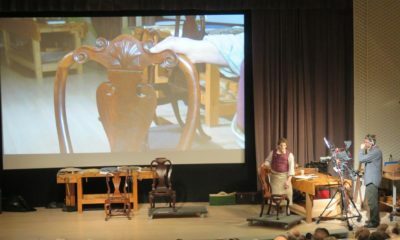 Given the vagaries of historic images when compared to the structure of chairs, it was indeed something to wrestle with. 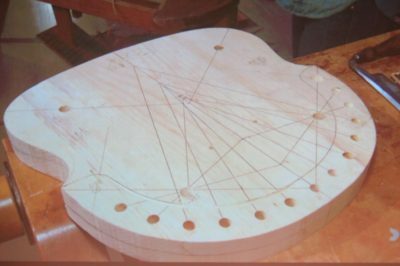 Bill engaged in one of the most innovative didactic exercises I’ve seen as he walked us through the evolution of the Chippendale chair by fabricating a display form on which he could attach full scale depictions for each of the major evolutionary steps in the design heritage. I found this to be a brilliant approach that should be employed everywhere for anyone interested in the subject. Since much of the character of the chair is contained in the carvings, that is where Bill spent his time. 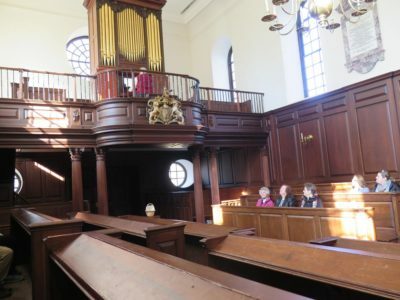 I must admit that I missed some of Bill’s presentation as I was 1) talking to someone out in the vestibule about some SAPFM bidnez, and 2) snuck out to go with my wife and some friends to an organ recital at the nearby Wren Chapel on the campus of the College of William and Mary. Sorry Bill, no disrespect intended. 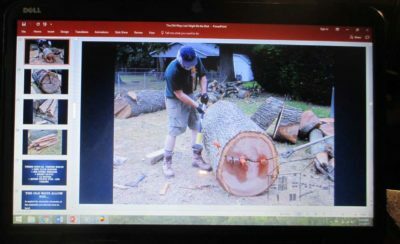 In the next four postings I will be highlighting the contributions by the CW craftsmen to the Working Wood in the 18th Century gathering. They work under the burdensome (?) expectation of excellence on our part, as for years they have not only put on the show as the impresarios but are expected to be stellar in their on-stage performances. It’s a lot of weight on their shoulders, and they pull it off every time! You can tell they are comfortable with audiences, I don’t mind folks watching me work, but the contant interruptions they endure must be maddening. It disrupts any work flow and extends a project’s timeline by a logarithmic factor. 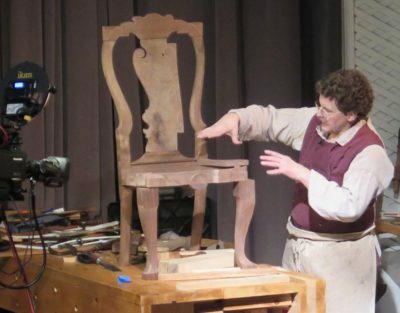 First up of the Colonialista soloists was Brian Weldy, demonstrating the steps to designing and building a late Baroque (aka “Queen Anne”) chair in walnut. As with all the presentations I found much to be learned from the project, although it is unlikely I will ever build one. Nevertheless Brian’s dealing with the sumptuously curvilinear form was instructive. 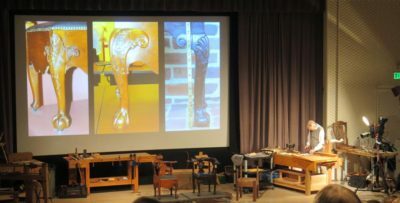 His layout of the serpentine center splat was particularly of interest to me as I have a pair of 16th Century Chinese horseshoe chairs on my bucket list. 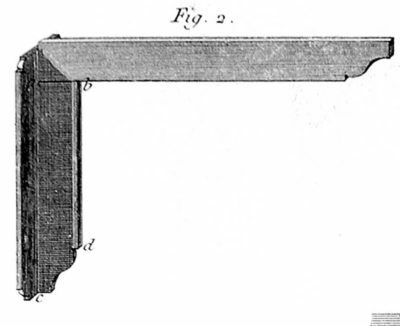 He called on Kaare to provide a second pair of hands for the assembly of the chair seat rail and legs. I was fascinated by the wooden blocks left on the serpentine seat rail to provide striking anf clampning surfaces. 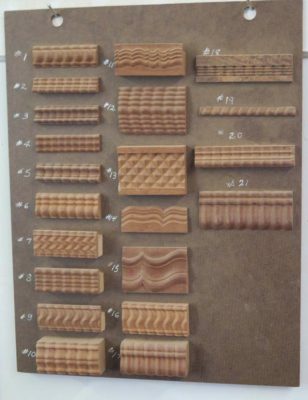 These would be carved off once the assembly was completed. I thought it was an ingeniuos and efficient solution to a problem. 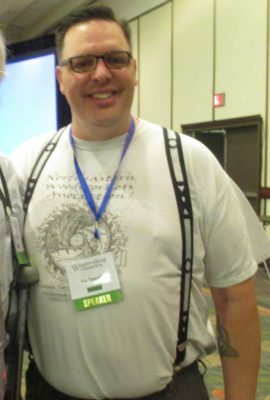 Maybe everyone else already knew it, but it is a technique now residing firmly in the memory bank. With the chair assembled Brian addressed the seat construction and lofting, and his time was done. I’ll interrupt my jaunt through the CW confab to mention some new things in the mail. 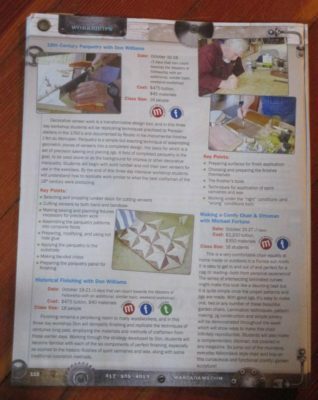 First off is the catalog from the Marc Adams School of Woodworking which includes this page describing the two classes I will be teaching this fall, Parquetry and Historic Finishing. 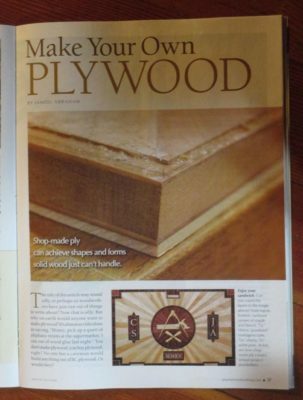 Yesterday saw the arrival of the new Popular Woodworking with some intriguing contents. 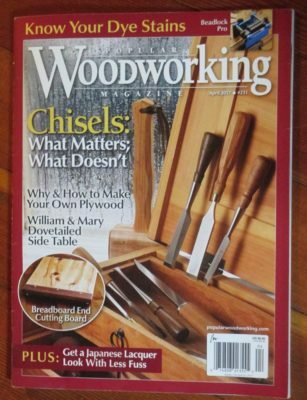 In addition to an excellent article on bench chisels from The Schwarz Hisownself there is a wonderful piece by my pal Jameel Abraham on making and using plywood. Solid. 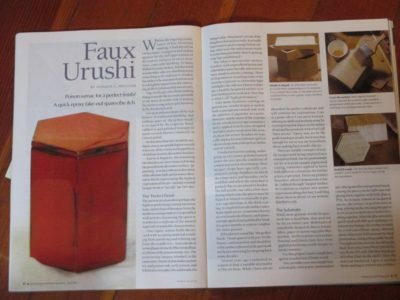 And immediately subsequent to Jameel is my latest article, which was about the most fun writing I have ever had. To top it all off I received a sample of some shellac wax from the producer in India. It is excellent and I am going shortly to the bank to make the bank-to-bank transfer to order several hundred pounds. This steady supply will allow us to begin manufacturing Mel’s Wax shortly. Stay tuned. 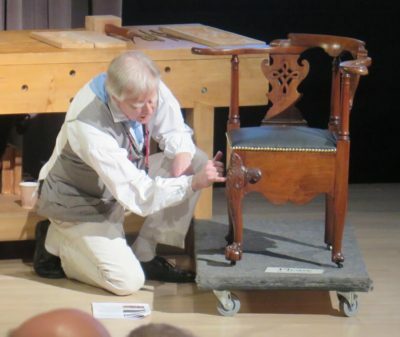 Of all the thing I learned at the recent Working Wood in the 18th Century shindig, two come into clear focus: 1) Peter Galbert is a rock star, and 2) even though I am not a Windsor chair sorta guy I somehow have to figure out a way to budget the time and finances to attend a workshop he is teaching. 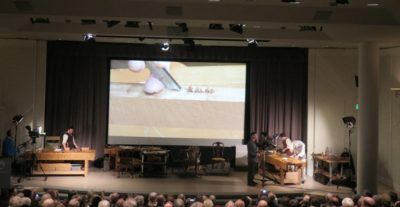 While I am not even a chair builder per se, Samuel Gragg chairs notwithstanding, I had been awaiting this presentation with great anticipation since I learned of it. 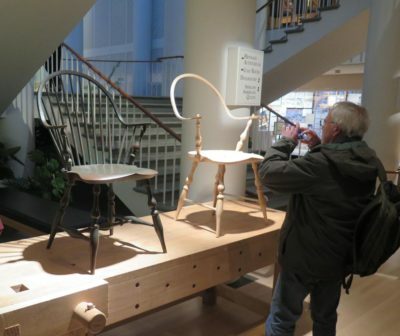 Pete’s book on chair building was a thing of great beauty and erudition; the highest compliment I can give it is that I wish I had written a book this good. When reading it I found myself smacking my forehead with every new nugget of enlightenment, which meant every couple of minutes or so. 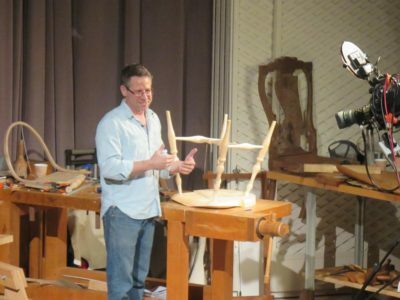 In much the same way as Krenov’s original trilogy, Chairmaker’s Notebook is a snapshot of the craftsman’s soul. 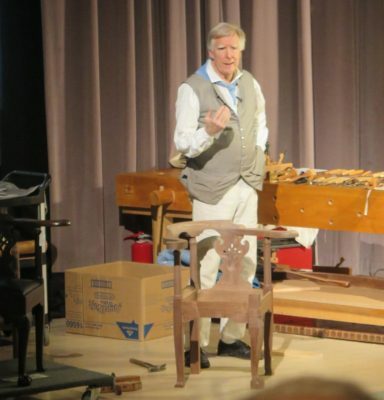 And here he was on stage, unfolding his methods of work. As my friend MikeM remarked, Pete’s performance was perhaps the most amazing example of cogent non-stop talking and non-stop working either of us had witnessed. 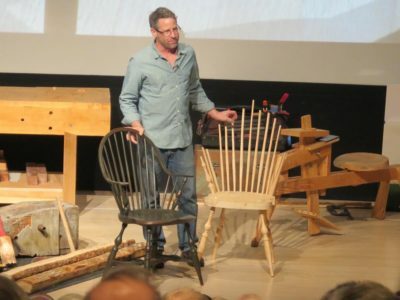 Next to both “peripatetic” and “loquacious” in the dictionary is a picture of Pete, and with great elan he walked us through the processes he uses to build his chairs, and his reasoning behind them. It was a beautiful thing to see. 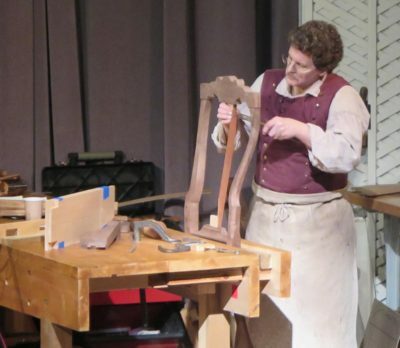 Beginning with the splitting of the green stock needed for the fashioning of the steam bent pieces and finishing with the assembly of the chair’s elements, I found this to be as grand a learning experience as any I have encountered in furniture making. 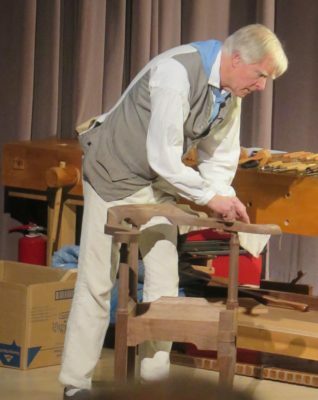 Along the way he showed how he lays out the geometry of the chair spindles and legs, steam bent the continuous arm/crest rail (I was too engrossed in watching to remember to take pictures), and even turning the green wood legs on a treadle lathe, he did not miss a single note. 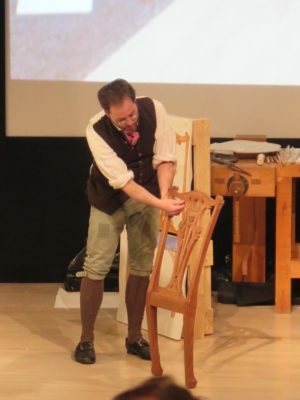 His assembled base with the arm attached was a great hit with the attendees as it was on display out in the vestibule of the auditorium. Well done, and thanks Pete. 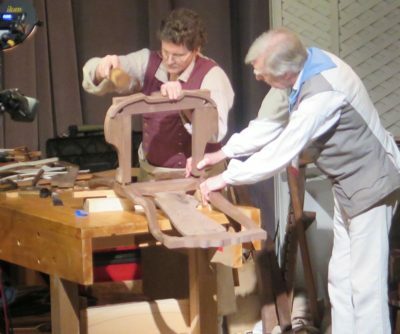 Recently I attended the annual Working Wood in the 18th Century shindig at Colonial Williamsburg. I’ve been to many of these gatherings over the years, but this was my first since moving to White Run, and also my first entree as a speaker. 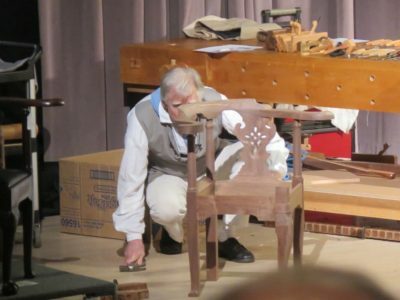 The theme this year was chairmaking, and the presenters were Kaare and Ted, along with Brian Weldy and Bill Pavlak, the journeymen from the Hay shop and Ted’s crew of interns from the Joiners shop, along with Windsor chair maker Peter Galbert and moi. 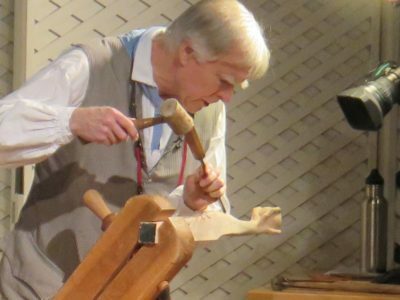 The general format for these has always been hands-on demonstrations by the CW craftsmen, usually from the Anthony Hay Cabinetmaker shop, currently mastered by Kaare Loftheim, and the Joiners shop, under the tutelage of Ted Boscani. 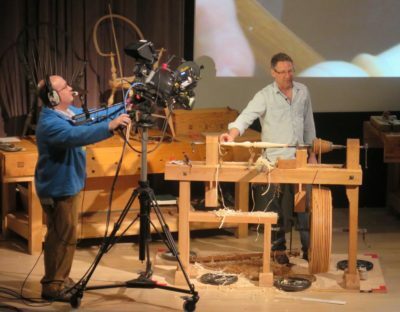 The setting for the conference is the Hennage Auditorium of CW, with each of the presenters engaging in actual hands-on work while engaging in soliloquies of discourse on their particular topic, on-camera with live microphones. 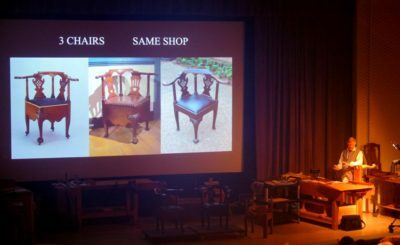 First up with the evening lecture on the opening night was Tara Gleason Chicirda, the long time Curator of Furniture for CW, presenting Craftsmanship of the American Chair. Tara possesses a breathtaking range and depth of knowledge about the things we care about, and I have never been disappointed by the many lectures I have heard from her. 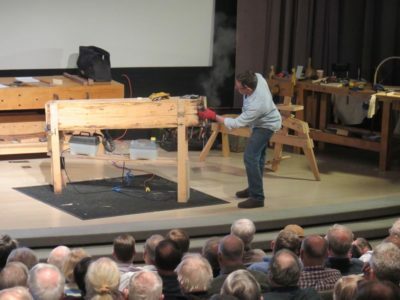 The next morning was started by a “three-ring circus” as Kaare, Brian, and Bill took the stage for near simultaneous expositions on their projects with a session titled Chairmaking Fundamentals–Three Chairs which set the stage for the exhilarating ride to come. More abut each of their projects in coming posts. Here is the full slate of activities. 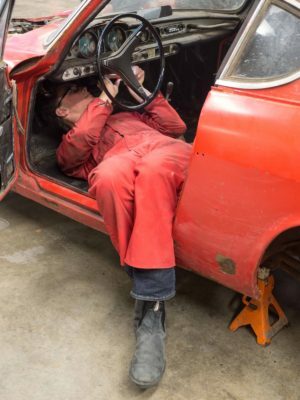 Konrad Sauer blogged today about my passing a torch to himself and his son, the “torch” being the restoration of a classic 1968 Volvo P1800 (the “Saint” car) I bought more than thirty years ago with the intention of restoring it into my every day car. Well, life intruded and it sat in my shed for all those years until I gave it to them last summer. It should be an ultra-cool project, and Konrad promised me a visit to The Barn on White Run with his wife once the project is done. 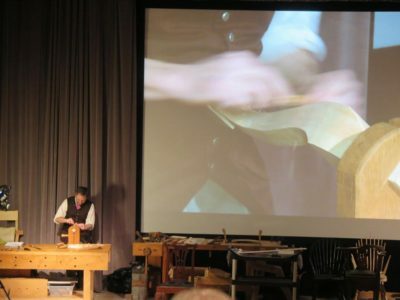 Can’t wait to follow the tale and to welcome them to the mountains..
Last weekend I spent putting the final touches on my Saturday evening banquet address for the Colonial Williamsburg conference Working Wood in the 18th Century. 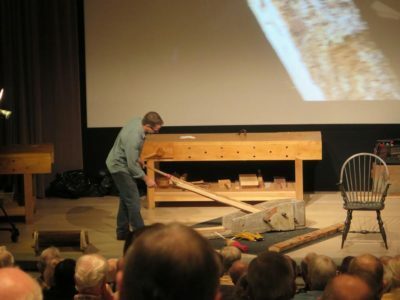 My after dinner talk is titled “The Old Ways Just Might Be the Best Ways,” and is a brief travelogue through the world of blended woodworking, using power tools when they are best, but especially using hand tools when they do the job better than any other approach. Earlier that afternoon I will be demonstrating oil and wax as finishing materials. I hope to see you there. Gotta go finish packing all my stuff now.